As far as first impressions go this isn’t bad at all, or maybe I’m just liking the matching couple shirts and couple Hallyu aura. 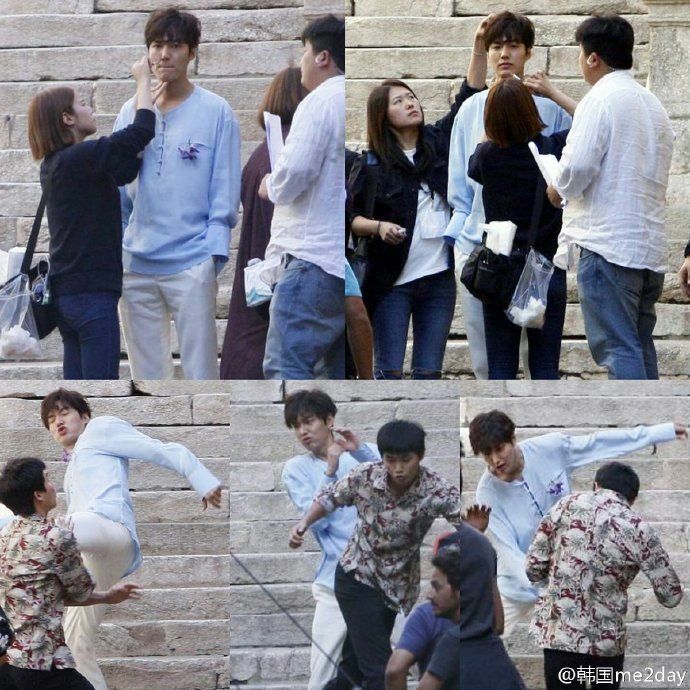 The first stills are out for upcoming SBS Wed-Thurs drama Legend of the Blue Sea, snapped by fans in Spain where leads Jeon Ji Hyun and Lee Min Ho are currently filming the overseas scenes. First off she’s got legs, gorgeous ones in those shorts to boot, which means her mermaid character has legs on land. The second thing that stands out is the scene showing the two leads are running away and Lee Min Ho is in an altercation of sorts, so maybe his con man character is in trouble somehow. Whoever snapped this passerby pictures did a fantastic job of capturing the filming, giving me just the right amount of drama excitement juice to keep the Legend anticipation train chugging alone. Whoever said JJH looked bloated post pregnancy needs to eat their words. She looks GORGEOUS and slim. I’d kill for her legs. And her face. Well, for any bit of her actually! Lol. The first pic looks like it came from a photoshoot dang,JJH look so gorgeous and model like and its not even edited yet fantastic.. The two are going to slay it all, even spain media is interested. LMH is a true Hallyu king. He’s got fans all over the world. I bet his fan snapped those shots. K2, and now This? Is Spain paying out heavy cash for these K-dramas to film there? Maybe her husband, family member, or nanny checked in before she did. Maybe she doesn’t like to parade her child like a show pony in front of all those cameras and fans waiting at the airport. Even if she left for a couple of weeks without her baby, she is no different than other working moms who have to travel abroad for work. If I were her, I probably wouldn’t want to bring a baby who probably hasn’t received his vaccinations against Measles, Mumps, German Measles or Chicken Pox. Why expose the baby in a plane with recycled air breathing other people’s germs. Hmmm. thats a point. Was wondering esp about Korean stars n that culture, isn’t JJH the only actress to ma mi e such a quick return to showbiz. Lee min jung, for other reasons, Lee Na young, yoo ji Tae’s actress wife , Lee Bo young, all just vanished bcz of baby. I know it’s a personal thing, n in the West, mom’s return to work even a week after birth. But in Korea, JJH seems the only one to do this…I thought the culture there women actresses just packed up bcz of babies.. Months old, not looksto type typo..
Leave months old baby for overseas shoots. Auto detect fill killed my comment. Sorry for spam repeats. Of course everyone has to earn a living. Lol bitter hater.